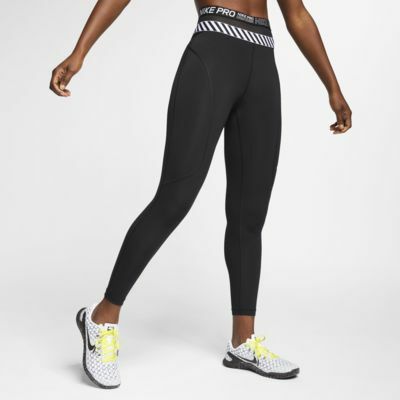 The Nike Pro HyperCool 7/8 Length Tights offer two times the style and support with a high-rise double waistband featuring breathable mesh and a repeating "NIKE PRO" graphic. The tight fit flatters your shape while design lines function to support key muscle groups. Double waistband features mesh sandwiched between elastic for bold style and support. Design lines function to support key muscle groups and add an element of style. Fabric: Body: 83% polyester/17% spandex. Gusset lining: 100% polyester. I wear these running outside (in balmy Scotland) and the cool material quality is superb. They’re lightweight and stunning on with the double high waist detail there’s no fear of them slipping down either. So good I’ve now got 3 pairs!